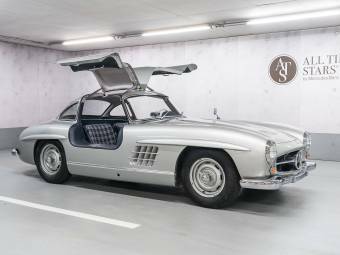 Due to the doors lifting like wings, the Mercedes-Benz Gullwing is such an iconic model, it would surprise most people that James Bond never drove one. 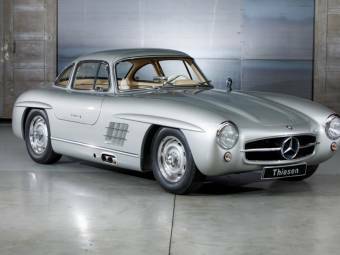 The Mercedes-Benz Gullwing started out as a model built specifically for racing in 1952 and it proved to be the fastest car in the world. 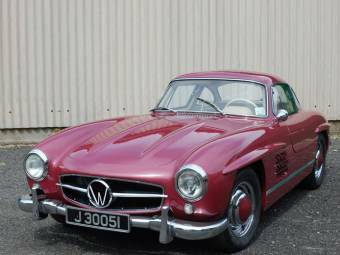 Due to its racing success and the post-war affluence increasing in the luxury car market, Mercedes-Benz decided to bring out a road-legal consumer version in 1954: the Mercedes-Benz 300 SL "Gullwing". The mid-1950s were a vibrant post-war time where a sense of freedom and personal wealth combined with the popularity of "sports" cars. 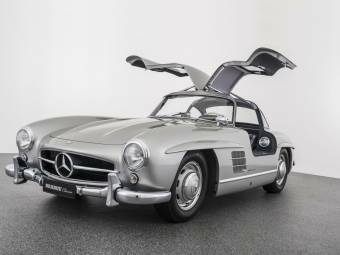 Mercedes-Benz Gullwing certainly caught that wave, and 3,258 were hand-built in coupe and roadster variants from 1954 through to 1963. The unusual doors weren't originally part of the design. However, the "spaceframe", a 50 kg light-weight racing frame for the car couldn't accommodate conventional doors. And so the "gullwings" were added to open at a hinge on top of the car. Its success on the GT racing circuit paved the way for its introduction as a consumer model two years later. Apart from the sleek body optimised for minimising wind drag, the next most obvious things that become apparent is when the doors open: The Mercedes-Benz Gullwing's doors open upwards. With the doors open, the car looks like a hovering bird. 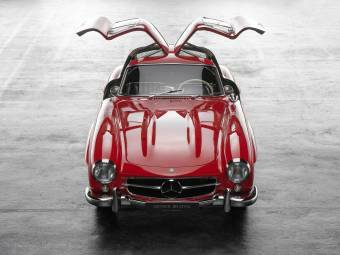 That's how it got the Gullwing name. 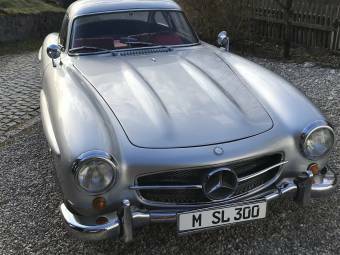 Under the aluminium body of the Mercedes-Benz 300SL Coupe, you'll find a 215 hp (250bhp/158 kW) three-litre engine capable of 250 km/h depending on final gearing. 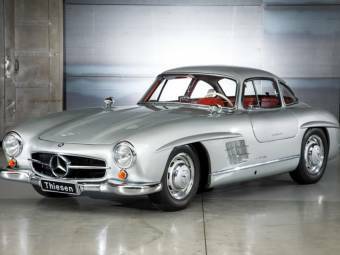 Mercedes-Benz Gullwing was introduced to the European GT race circuit in 1952, where it competed in the Mille Miglia race from Brescia to Rome and back. This proved to be the only race where the Mercedes-Benz Gullwing failed to take first prize. The car finished four minutes and 32 seconds behind Giovanni Bracco in the V-12 Ferrari, but the Mercedes-Benz Gullwing had lost six minutes in a pit stop. After three races, the car was retired as the designers felt the hastily assembled model could easily be improved upon. Due to pressure from Mexican race enthusiasts, the Mercedes-Benz Gullwing was entered into the 1,946 mile (3132km) run from Tuxtla Guterrez on the border of Guatemala to Cuidad Juarez on the U.S. border. The two Mercedes-Benz Gullwings that entered the race took out first and second place.